Desert island Discs came up in two conversations recently. Firstly, this is not surprising, since in my case I only have n things to talk about, where n is not a very large number. One: I gave an internal talk at work recently and in passing mentioned Desert Island Discs, my favourite programme on Radio 4. A colleague who will remain unnamed asked 'is that the channel with no music on?' and I gave the correct but incorrect answer 'yes': incorrect of course because of the very said programme. 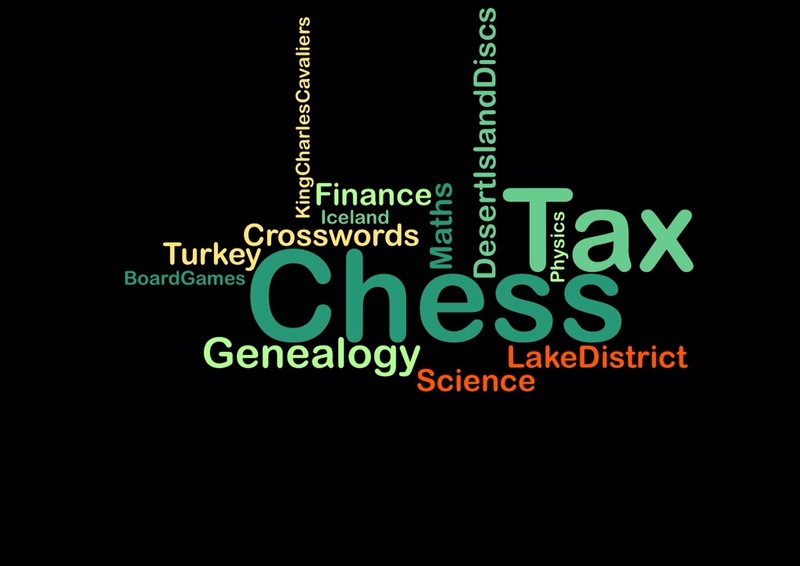 (For colleagues who read this blog, the said colleague is (i) the life and soul of the tax department (ii) former deputy head girl at the girls' division of my school (iii) Greek Cypriot. Those clues might help her be identified)). Thank you, Théa Gibson, for making me feel old. Two: A very close friend of Jane and mine happened to tell me recently that one of her favourite programmes was also Desert Island Discs. She asked me which my favourite episodes were, and this has set me thinking, and was the ultimate trigger for this blog posting. All past episodes are available on the BBC website. 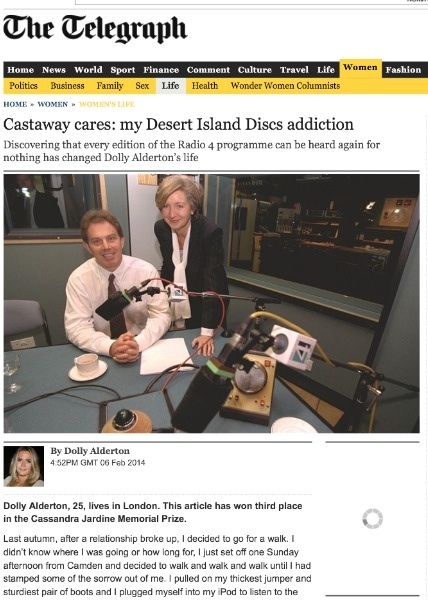 My first recollections of Desert Island Discs was a child: my mother used to listen to it, and I would dip into it; I suspect subtly it became infused into me. Roy Plomley was the presenter, and creator of the programme, and I think there was a dispute between the BBC and his estate over broadcasting rights: whether that is the reason, but the downloads are all truncated, with only excerpts from the music selections. I didn't remember Michael Parkinson having been the presenter, and only listened to it occasionally during the years when Sue Lawley hosted it, but nowadays, with Kirsty Young, I listen to most of the shows. This list is more or less entirely from recent episodes. I listen to the programme as a relaxation, often on my way home from work, and not with full concentration. Sir Andre Geim, the Manchester University based Nobel prize winning physicist, discoverer of graphene. Jayne Torvill and Christopher Dean, ice skaters, who, of course, chose Ravel's Bolero. Gyles Brandreth, former MP, writer. Preparing this list, from the archives on the Desert Island Discs website, reveals many more that I would like to listen to, or listen to again. And it also reminds me that the essence of the programme which makes it appeal so much to me is that it is about people, human stories, and variety. 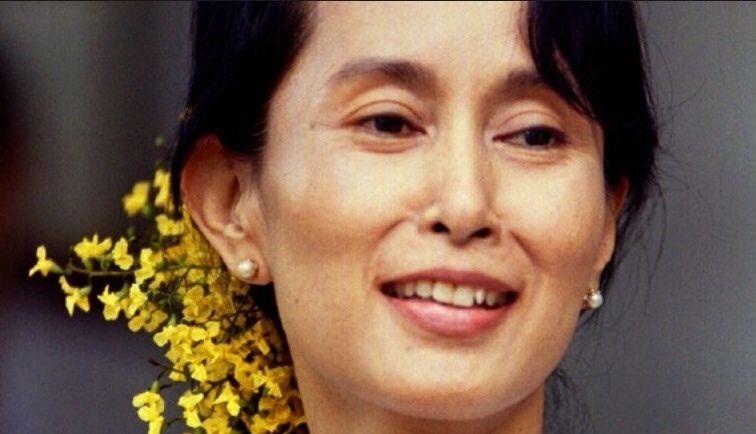 It is very unfair of me and somewhat dubious, but if I were to pick one for someone who has never listened to the programme to listen to, it would be Aang San Suu Kyi. 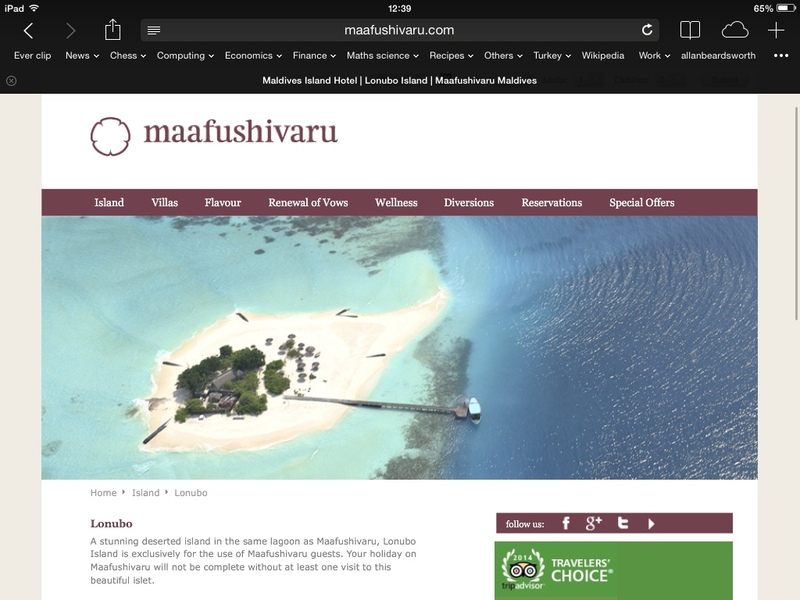 (Almost) Finally, if my blog doesn't convince a neophyte, consider reading this excellent, prize winning, article by a young writer. 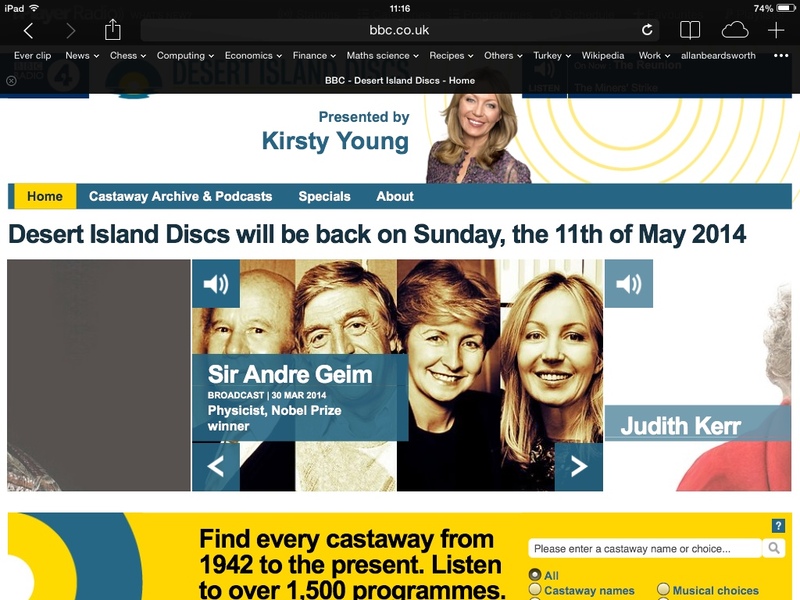 If this doesn't convince a person to try Desert Island Discs, nothing will. Finally, the odds on me appearing on Desert Island Discs is a million to one (or more accurately 63 million to one, namely if they ever pick a random member of the UK public to come on the show). Therefore, when I was on a desert island, I came up with my own list.